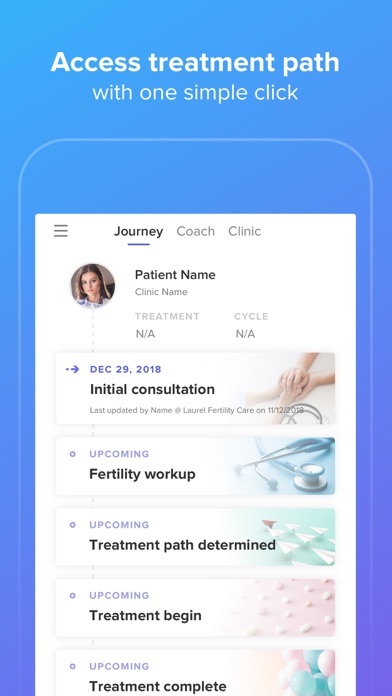 It’s very helpful to use a well designed mobile app to guide my fertility treatment. No need to go through emails or calls each time I have a question or help wanted, I can get in touch with my coach easily. Not able to conceive naturally is emotionally draining. But the most challenging part is not able to get the right information and support. This app provides detail clinic information and gives all the important information about seeking the right IVF solution. 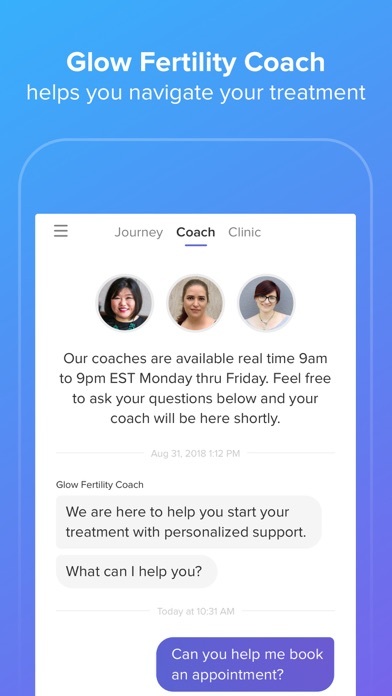 The best part is you have real time access to seasoned fertility coaches that can guide you every step of the way. Simply awesome!! I wish I could have had this for all my cycles - such a lifesaver! 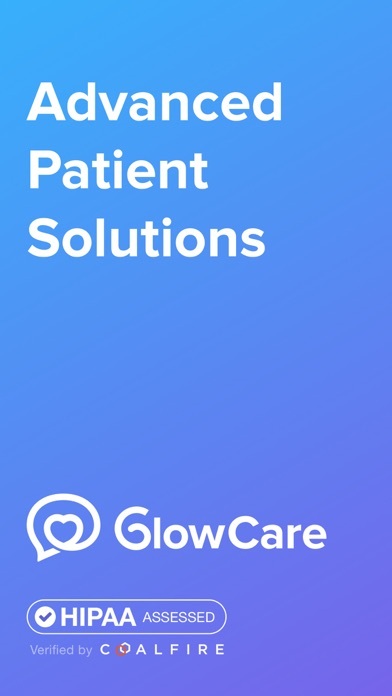 Love to see that Glow launches a new app to support my fertility treatment by offering all the information at one place. Easy to navigate and find the info I need. Real time chatting is my fav as I can get response right away from professional coaches. Didn’t find any other app that is as easy and straightforward as this one. It’s a great start. Love the way how journey is mapped out. Please keep adding more feature. 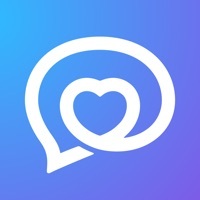 This app is so helpful that I am able to chat with my fertility coach anytime and anywhere. With this app, I no longer have to go through back-and-forth emails/phone calls to nail down the appointments and to ask trivial questions. More importantly, all the conversation here is HIPPA-compliant so I don’t need to worry about the security issue. Another thing I love the app is that I can quickly and clearly know where I am and what next steps would be by looking into my treatment path. The articles and clinic information are also helpful. It would be better if the clinic page can include the hours. Access to the clinic info at one place. The app is nicely designed and I can easily find what I want. Less is more! 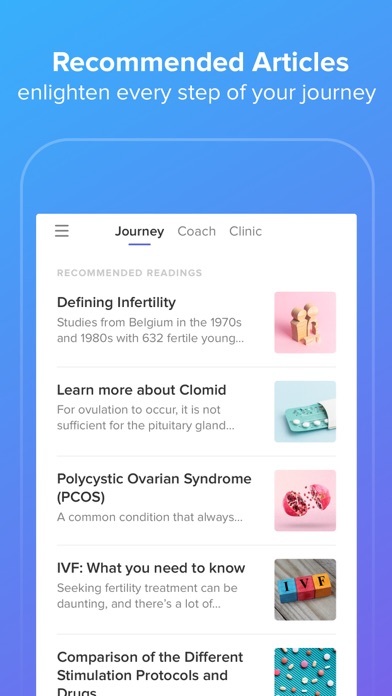 The app gives me just right what I need at every step, such as recommended articles helping me learn more before and during my treatment. Coaches are always there when I have problem. 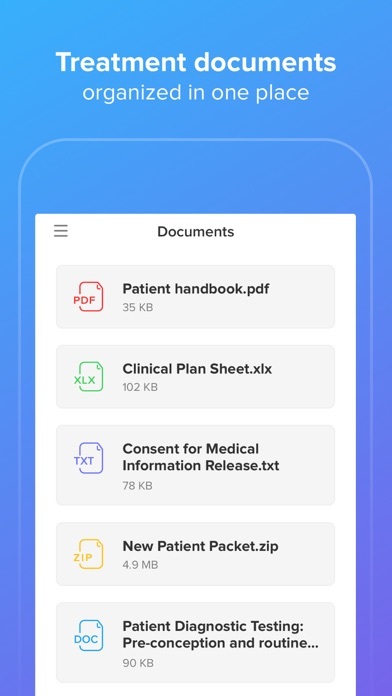 I’m the kind of person who extremely concerned about personal privacy and this app is trustworthy and secure as it is HIPAA compliant. It’s really exciting to use a professional mobile app to support my treatment journey. I like to CHAT with my coach in this app! It even support sending and receiving files. UI is very nice. I felt loved and supported from day one by the entire staff. They had patience with all my questions and always treated me with love and care. The doctor was always positive and explained everything in such detail. She always returned our phone calls and was such a joy to be around.